There is a famous library in Tamegroute, with 4,000 ancient books, going back almost 1000 years. There are some ancient copies of the Q’uran , written on deer-hide, with the initial letters of each Chapter decorated with Gold and Saffron. Tamegroute is also famous for its potteries and especially for a particular kind of green glaze containing copper. However, these things come at a price: it seems that if you want to see anything on the tourist route, you have to brace yourself. As soon as we step out of the van, we are tailed by various people, offering to be our guides. Here they don’t work against each other but as a group, because ultimately all the ‘takings’ are fed into the same co-operative. We shake off the first two or three of them, but when someone comes towards us in the courtyard that we have snuck into, despite it being closed that day, we are trapped. There is something very authoritative about the way he points to the exit and then takes control, leading us through the back streets, where we get a glimpse of the underground dwellings, which protect people from the summer heat, before he takes us into the pottery co-operative. We enter a very busy courtyard where boys and men of all ages are at work. 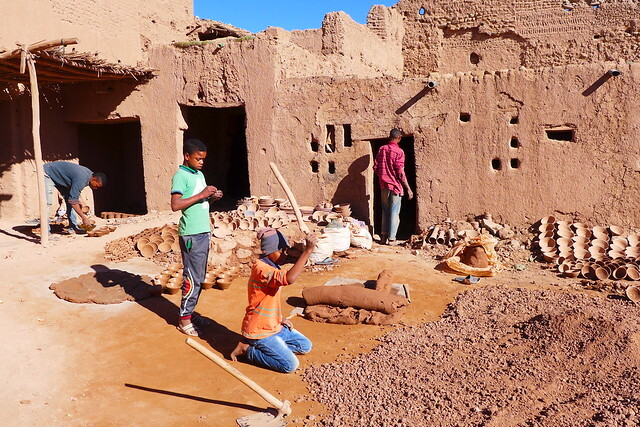 The young kids kneel on the ground whacking the dry clay with sticks to crumble it. Young men heft buckets of water from the well, mix it with clay powder and roll it out in big slabs, not unlike the making of Devon fudge in the shop in Totnes, only on a much larger scale and on the ground. The adult men are involved in making pots. 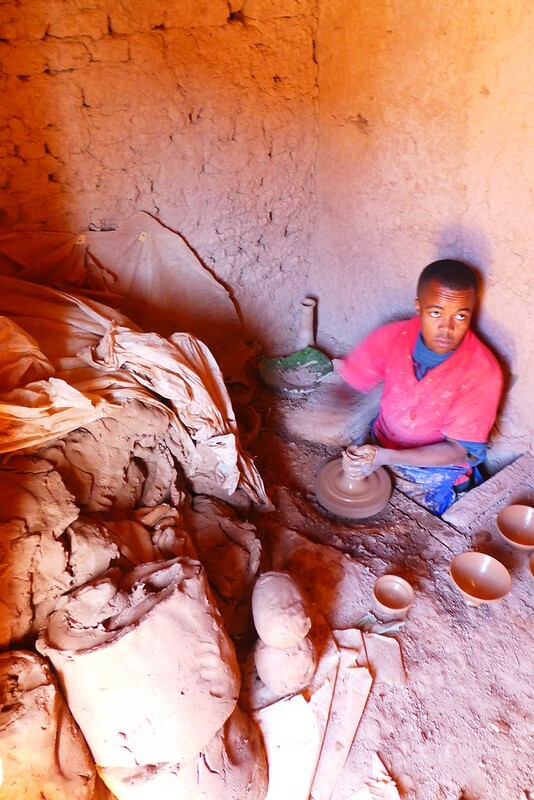 One sits on the ground, his legs and feet disappearing into a hole in the ground, where he operates the treadle of the potter’s wheel. 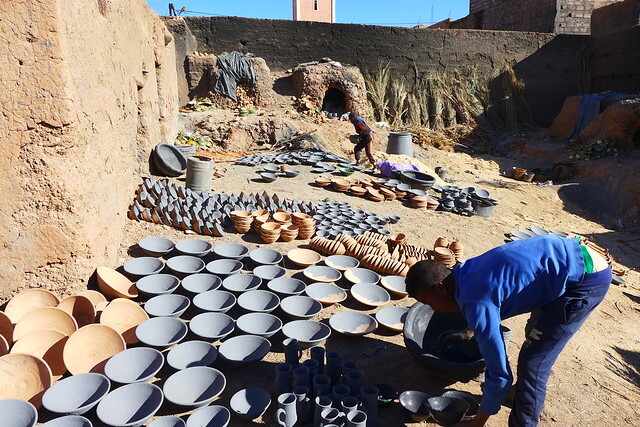 Others fold themselves into a z-shape to climb inside the still hot kilns to bring out the freshly fired pots. Yet others take the items and dunk them in a bucket of glaze, without gloves (let’s hope the glaze is all natural). It’s a busy atmosphere but it’s quiet, not hectic. There is a good feel about the place, despite it being hard work. This could be deceptive, I’m well aware of that, but if that is so, they give a perfect performance for the tourists, because by the time the guy leads us into the showroom, we are ready to part with money for the first time in 6 weeks of avoiding the acquisition of ‘stuff’. 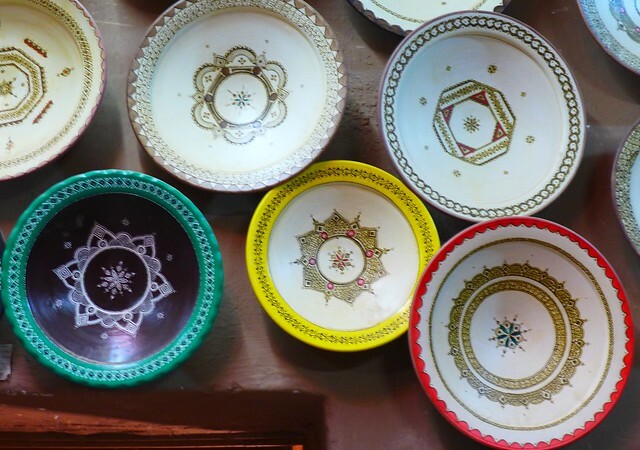 The wares they offer are good quality and beautiful colours (especially the deep green that is particular to this town) with decorations, done by the women in the souterrain houses. Apparently the heat gets up to 50 degrees in the summer and those underground houses are the best place to be, but still, it seems quite something to be so shut away. When the women do come outside, they often are more wrapped up here than in the other regions we’ve visited. When we finish choosing, but before paying, they say, how about some exchange of things, why not bring your van up here. The gazelle can stay here (that’s me, by the way) and you Monsieur can get the van. So Frank gets escorted and I get kept. All with a smile of course. While I’m sitting and being entertained, I realise it was a very clever move to separate us – if we’d paid up and both gone to get Emma, there would have been a chance we’d just take off, foregoing the barter stage. When Frank comes back with Emma we invite them all into the van and we start digging for things that may interest them. One guy in particular takes over, but the others watch and chip in (or maybe watch and learn). We unearth three cans of beer, two bottles of wine, a jar of Frank’s marmalade, several candles, an old coat, a foldable water container, some slippers and various other bits and pieces. We even offer two big chunks of the wood we have picked up from the side of the road, but he takes one look and declines them as being too fresh. It would make too much smoke. There is a momentary stop to the bartering when we realize that their idea is to barter for additional items of pottery, but we insist that we don’t want to buy more but instead lower the price of what we have already bought. There follows 15 minutes of haggling, which they win hands down – they are so much better at it than us. Never mind, we have a good time with them, with much laughter, and I think of our loss as a payment for the entertainment, just like one pays for going to the theatre. I notice just a tinge of guilty conscience on the part of the guy who ‘delivered’ us to the pottery. When the others leave, he invites us for a couscous the next day. As we have to come back anyway, to see the library, we happily accept and tootle off out of town to recover from having been so mercilessly milked.